Another number the college has become aware of recently is 1,300 – the number of door openings campus-wide. The reason the facilities and college police teams at Saddleback know this number is because the college will soon install access control devices on nearly every opening on campus. “Every single one of them except for the restrooms,” Rogers says. An exterior access point at Saddleback College’s new sciences building. Further, when implementing an access control solution that would change from physical keys to a credential on an ID card, the school wanted to ensure that it could manage the credentials from a centralized system. That way, access could be set and revoked on a semester-by-semester or even a daily basis. The ability to quickly secure the school is really the primary reason for this… It all comes down to the ability to know what is going on across campus and lock down buildings appropriately. 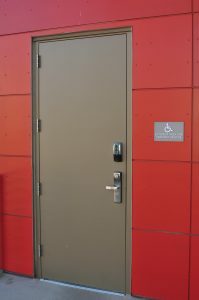 The goal for Saddleback is to standardize all of their unique openings with interoperable access control. And with ASSA ABLOY offering a broad number of brands and solutions that work together, the school has developed a plan around minimizing systems and physical keys.